This article is about the Spanish guerrillas. For other uses, see Maquis. Principal areas of Maquis activity within Spain (orange), 1939–1965. The Spanish Maquis were Spanish guerrillas exiled in France after the Spanish Civil War who continued to fight against Francoist Spain until the early 1960s, carrying out sabotage, robberies (to help fund guerrilla activity), occupations of the Spanish Embassy in France and assassinations of Francoists, as well as contributing to the fight against Nazi Germany and the Vichy regime in France during World War II. In the south-west part of France where no Allied armies have ever fought, they liberated more than seventeen towns. Also during World War II, Spaniards assassinated the German generals von Schaumberg (commandant of the region around Paris) and von Ritter (a recruiter of forced labor). In October 1944 a group of 6,000 maquis including Antonio Téllez Solà invaded Spain via the Aran Valley but were driven back after ten days. 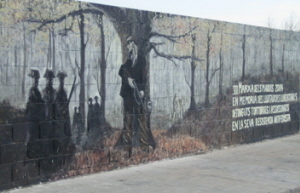 Few details of the maquis' actions in Spain have been made public because of the secrecy of the Franco government, but guerrillas, including Francesc Sabaté Llopart, Jose Castro Veiga, and Ramon Vila Capdevila were responsible for the deaths of hundreds of Guardia Civil (Civil Guard) officers, and uncountable acts of industrial sabotage. Between 1943 and 1952, 2,166 maquis were reported arrested by the Civil Guard, nearly wiping out the movement. The term maquis comes from the French term maquis, which in turn comes from the Corsican term macchia, the maquis shrubland, a type of biome found in the Mediterranean basin, mostly associated with Corsica. In France, the term was first used to refer to a group of guerrillas of the French resistance against the German occupation of France during World War II. The resistance fighters in these encampments were referred to as maquisards. The anti-Franco guerrilla resistance in Spain began before the 1939 end of the Spanish Civil War. The outbreak of World War II so soon after the civil war surprised a large part of the Spanish Republican exiles in France; many of them joined the French Resistance. By 1944, with the German forces in retreat, many of the guerrillas refocused their fight towards Spain. Despite the failure of the invasion of the Val d'Arán that year, some columns continued to progress into the Spanish interior and to connect with the groups that had remained in the mountains since 1939. The apogee of guerrilla action was between 1945 and 1947. After this, the repression from the Franco government intensified, and little by little the groups were destroyed. Many of their members died or were incarcerated. Others escaped to France or Morocco. In 1952, the last important contingents evacuated from Spain. After that, those who resisted in the mountainous regions refusing to choose either exile or surrender, fought only for their own survival. The origins of the maquis in Spain lie with those who fled the advancing forces of Franco's Nationalists. The insecurity engendered by the repressive tactics of the Nationalist insurgency turned their political opponents—even many who were not politically active but simply known to sympathize with the republic—into fugitives. At first many hid in relatives' homes, but some sought refuge in the mountains. Their numbers were enhanced by deserters and by escapees from prisons and concentration camps. These constituted the nucleus of those who decided to keep fighting from the mountains. The political character of the guerrillas was as varied as that of the Popular Front, containing communists, socialists, and anarchists. Despite the diverse ideologies, due to the organizational persistence of the Communist Party of Spain until 1948, the Communists dominated the other currents. During the war, the idea of the possibility of a guerrilla war at the rearguard of Franco's Nationalists was proposed. The idea came to fruition at the initiative of Juan Negrín, at the time head of the Republican government and of the Ministry of Defense. He created the XIV Cuerpo de Ejército Guerrillero (Guerrilla Army Corps) in October 1937. This name was used for the Basque section of the Spanish Republican Army until the collapse of the front in the north. The short-term objectives of this Corps were the interruption of the communications and supply lines to the Nationalist troops, and the carrying out of special operations. In the long term, they were to continue the war against Franco in the case of defeat on the conventional fronts. At the end of the war, such activities had been set in motion on the fronts of Teruel, Andalusia, Extremadura, and Toledo. The action with the greatest significance was the liberation, on May 23, 1938, of 300 Asturian political prisoners in Granada. Throughout 1938 and 1939 the Corps brought together many of the exiles of Andalucía and Extremadura; however, the Republican defeat brought the dissolution of the Corps. Hundreds of thousands of Republican soldiers and civilians crossed the French border ahead of the advancing Nationalist troops in Catalonia. Once on the other side, they were put in concentration camps by the authorities. There were 22 camps in total: Barcarès, Agde, Saint-Cyprien, Argelès-sur-Mer, Berck-Plage, Montpellier Chapallete, Fort Mahon Plage, Tour de Carol, Septfonds, Baste-les-Foages, Bram, Haros, Gurs, Vernet d'Ariège, Rivesaltes, Fort Colliure, and Rieucros in Metropolitan France and, in French North Africa, Camp Morand, Meridja, Djelfa, Hadjerat-OM'Guil, and Ain-el-Curak. In these camps, exiles began to reorganize themselves into guerrilla groups. In the camp of Argelès-sur-Mer a series of meetings were held. Members of the PCE and the Juventudes Socialistas Unificadas (Unified Socialist Youth) participated. In October 1940, the decision was made to organize anti-fascist actions in France, together with the French resistance, against the Vichy government. This was the beginning of the Spanish involvement on a grand scale in the fight against the occupation of France. On October 11, 1940 the Vichy regime started the Companies of Foreign Workers (Compagnies de Travailleurs Etrangers, CTE), which permitted prisoners to leave the concentration camps, if they would go to work in factories. This increased the possibilities of escape. Shortly after the Vichy regime established the Obligatory Work Service (Service du travail obligatoire, STO) for French citizens, with similar objectives: to provide manual labor to armament factories and the construction of the Atlantic Wall. Those French who were released through the STO began to escape to the mountains, where they came together with Spanish who escaped from the CTE. The French escapees were mainly civilians, rather than a remnant of the defeated French army. From this time, the French term "maquis" began to be used to refer to the camps, and "maquisards" for those that occupied them. Some of the Spanish refugees joined French resistance groups, while others formed autonomous groups. In April 1942 a meeting of several Spanish combat groups decided to take the name of the XIV Cuerpo del Ejército de Guerrilleros Españoles, considering themselves the Corps' successors. In May 1944 the XIV Corps re-formed as the Agrupación de Guerrilleros Españoles (AGE, roughly Spanish Guerrilla Group), because they consisted for the most part of Spanish combatants on French soil. This conveyed the group's distancing from the Francs-Tireurs et Partisans (FTP), the armed branch of the French Communist Party, with whom they had previously worked closely. By this time, the Spanish resistors had participated in numerous armed actions against the German army, even liberating various populations in the south of France. The numbers of Spanish combatants in the ranks of the Resistance vary quite a bit amongst sources, but in general they accept a number around 10,000. After the German army was driven from France, Spanish maquis returned their focus to Spain. One of the valleys used as an entry into Spain during Operation: Reconquest of Spain. The most notable operation of the Spanish maquis was the invasion of Spain by between 4,000 and 7,000 guerrillas through the Aran Valley and other parts of the Pyrenees, well equipped and with heavy armaments, on October 19, 1944, after the German army had been driven from the south of France. The invasion was named "Operation Reconquest of Spain". Operation Reconquest of Spain was planned by the AGE staff. To carry out the invasion they created the 204th Division, made up of 12 brigades. The division was commanded by Vicente López Tovar. The objective of the offensive was to retake the sector of Spanish territory comprising the land between the Cinca and Segre Rivers and the French border. Later, the zone was declared conquered by the Republican government in exile, with the intention of provoking a general uprising against Franco throughout Spain. It was hoped that it would force the Allies to "liberate" Spain the same way it was "liberating" the rest of Europe. The main attack in the valley was accompanied by operations in other valleys of the Pyrenees during the previous weeks, with the objective of distracting Franco's forces. These other attacks were intended also to evaluate the situation in the interior of Spain, and make contact with other groups of exiles. The most important points of penetration in the long chain of mountains were Roncesvalles, Roncal, Hecho, Canfranc, the Aran Valley, Andorra, and Cerdanya, though there were also operations at smaller points. The offensives were repelled by a great force that was moved into the area by Franco, made up of Guardia Civil, armed police, battalions of the Spanish Army, and 40,000 Moroccan troops. The guerrilla army conquered various towns and villages, raising the Spanish Republican flag, carrying out anti-Franco meetings in the plazas, as well as controlling part of the French border for several days, through which they were able to bring in trucks, material and reinforcements from France. However, the invasion failed to take Vielha, its principal objective. Finally, overwhelmed by the Nationalists' numeric and material advantage, the guerrillas pulled back. The retreat ended October 28, when the last guerrillas re-crossed the border back into France, without the hoped-for uprising. The failure of the invasion was used by the pro-Stalin members of the PCE's Central Committee, recently arrived from the Soviet Union to France, to purge the heads of the party who had remained in France fighting the Germans. Most were either kidnapped and assassinated or summarily judged and shot. In spite of the setback of Arán in 1944, the expectations of the exiled Spanish Communist Party (PCE) remained high, given that all seemed still possible in an international context of general collapse of fascism. All throughout Spain, the level of guerrilla activity went up, precipitated by the incorporation of new contingents forced to cross the border from France and the reorganization of the groups with structures of a more military character. The exiled PCE promoted the creation of the Agrupaciones Guerrilleras (Guerrilla Groups) in several geographic zones, coordinating the actions between them. It was modelled after the Federación de Guerrillas de León-Galicia, the first guerrilla organization of the post-war era. The most active group from the AG was the Agrupación Guerrillera de Levante y Aragón (AGLA), which was active in the area between the southern part of Teruel, the interior of Castellón and the north of Cuenca. Also noteworthy was the Agrupación de Guerilleros "Stalingrado" (Stalingrad Group) headed up by Manolo el Rubio (Pablo Pérez Hidalgo), which operated in the Sierra de Bermeja near Cádiz, and at its peak boasted a force of 50 resistance fighters. All these groups were extremely sectarian in their aims and organization, following invariably the strategies dictated by the Central Committee (controlled by Moscow). The will to keep fighting was maintained by strict discipline imposed by the PCE kommisars. People in these groups who wanted to leave and rejoin a normal civilian life were most of the time treated as deserters and shot, even at the rearguard guerrilla camps in France. In 1948 the PCE changed its strategy, and at the behest of Stalin, renounced the guerrilla fight, preferring to try to change the state-sanctioned Spanish Trade Union Organisation from within. This began the decline of the agrupaciones, already quite beaten by government repression. The Agrupaciones Guerrilleras renamed themselves Comités de Resistencia. The new orientation, however, was not effective, and ultimately a general evacuation was decreed in 1952. There were several factors in the decline and disappearance of the Spanish maquis. On one side, the commencement of the Cold War made it evident that the Allies would not intervene in the maquis's fight against the Spanish State. This led the PCE to change strategy, ending its support for the guerrilla groups in the 1950s. On the other side, the actions of the Spanish police were wearing down the population in the areas populated by the guerrillas. Their repressive tactics ranged from searches, to the utilization of contras to uncover maquis links, to the scorched earth policy utilized in Maestrazgo. The Guardia Civil removed the population from many mountain zones where support for the guerrillas had continued, intending to deprive the guerrillas of this support. Torture was a common practice during interrogations. The government had a policy of total silence on the actions of the maquis. For this reason, outside of the areas of maquis activity, the population had practically no knowledge of the maquis. On the rare occasion that an item appeared in the press, the maquis were always referred to as "bandoleros" (bandits), in order to strip the actions of all political context. Steadily, Francoist forces isolated the guerrillas. Most of their members were middle-aged or older by 1950, with the consequent detriment of their physical capacities accelerated by years of living exposed to the elements and the lack of proper medical and food supplies. In these last years, many attempted to escape to France. Of those who stayed in Spain, some were sentenced only to jail (some spent up to 20 years in prison), some were judged summarily and shot, and others died at the hands of the Guardia Civil through application of the Ley de Fugas ("law of fugitives"). Although the period of major guerrilla activity ranged from 1938 through to the early 1950s, some groups continued to fight. The end was marked by the shooting deaths of Francisco Sabate Llopart (El Quico) in 1960, and Ramon Vila "Caracremada" in 1963, both in Catalonia, and José Castro Veiga in Galicia in March 1965. Maquis were active mostly in mountainous areas throughout the peninsula, preferring forests or areas of dense vegetation that would provide shelter and cover. Another important factor in the location of maqui groups and their survival was the social situation. They had to choose areas in which they could count on the collaboration of at least part of the population, given that without support they could hardly sustain a guerrilla group. In areas of harsher weather, like in the mountains of León, the maquis would relatively often pass periods of time more or less "undercover", in small groups, in support houses in villages, especially during the winter months. Among the areas of major maquis activity were the Cornisa Cantábrica, from Galicia to Cantabria, especially the mountains of Asturias and the area north of León; the Iberian System, specifically the area between the provinces of Teruel, Castellón, Valencia, and Cuenca; Centro, which consists of Extremadura, the north of Cordova, Ciudad Real, Toledo and the mountains of the Sistema Central; and two independent areas in the south of Andalusia: Cádiz on one hand and Granada-Málaga on the other. There was also activity in other areas, such as La Mancha and High Aragon. Armed resistance groups were also active in cities, although only prominently in Madrid, Barcelona, Málaga and Granada. In Madrid, the maquis' character was predominantly communist, supported by the PCE. Their activities did not, however, last long. On the other hand, the maquis acting in Barcelona, were mainly anarchists. This city was the last urban place to see activity of maquis. Attempts to extend the fight to other capitals like Valencia and Bilbao were unsuccessful. The generally rural and isolated character of the areas of guerrilla activity constituted an obstacle to the maquis' objectives. In effect, given the silence of the press and government on the situation, very few and scattered inhabitants of areas of maqui activity were actually aware of the conflict. The greater part of the Spanish population was ignorant of the war going on in their mountains. Sustaining guerrilla activity was dependent on sectors of the population known as "enlaces" (literally, "links" or "relationships"). There were others called "passive militias", and "guerrilleros del llano" ("guerrillas of the plains"), who supplied aid, from food to armaments when necessary, as well as information. They would also deliver mail or correspondence for the groups. The enlaces were much more exposed to the repressive actions of the government. However, they made up a source of combatants, since in the event of being discovered, their only chance to avoid being jailed was to flee to the mountains. Because of this, in the early 1950s when guerrilla activity was in its death throes, groups were still incorporating new men and women. The number of enlaces was much higher than that of actual combatants. During the years of guerrilla activity, 20,000 people were arrested for collaborating with the maquis. Benigno Andrade, also known as "Foucellas", a Galician maqui. He carried out actions against the Guardia Civil, mostly in Corunna Province. He was arrested March 9, 1952 and tortured during the following days, finally being executed in the prison of Corunna on August 7, 1952. Felipe Matarranz González, also known as "El Lobo", Manuel Zapico, also known as "El asturiano", Ángela Luzdivina García Fernández, Cristino García Granda, Asturian maquis. Joaquín Arasanz Raso, also known as "Villacampa" and "el maqui", active in Aragón. In Catalonia, the group of Francesc Sabaté Llopart, "El Quico", acted in cities like Barcelona. The group of Marcel·lí Massana i Balcells, together with Ramon Vila Capdevila (also known as "Caraquemada") acted principally in the Catalan counties of Berguedà, Osona and Bages, and the Barcelona Province. Josep Lluís i Facerias, also known as "Face", and his group concentrated on robbing banks to financially support the families of people incarcerated by the Franco government. Casimiro Fernández Arias led a group of former Republican soldiers caught behind enemy lines who held out for nine years in the Cantabrian mountains, in the area surrounding La Vecilla, in the province of León. Their whispered history inspired the 1986 novel Wolf Moon by Julio Llamazares. Manuel Girón Bazán, also known as "Girón", maqui from León, carried out acts principally in Bierzo. Pablo Pérez Hidalgo, also known as "Manolo el Rubio", who headed up various groups operating in the mountains near Ronda in Málaga province and the Sierra Bermeja, near Cádiz, in the 1940s. He was finally captured by the Civil Guard in 1976. Antonio Téllez, fought in the invasion of the Val d'Aran, and later wrote biographies of Sabaté, Facerias, and Salvador Puig Antich. Abel Paz, was jailed twice by the Franco government, has written several books on the Spanish Civil War. Eduard Pons Prades, in 1942, formed part of an anti-fascist group in France, was in the group Solidaridad Española, initiating acts of sabotage, and worked with the group Ponzán. La Pastora, nickname of Florencio Pla Meseguer, also known as Teresa (1917–2004), a Spanish Maquis born in Vallibona who used to disguise as a female and operated in the Maestrat area until the early 1960s. Xosé Castro Veiga (1915–1965), the last guerrillero. Behold a Pale Horse, film loosely based on the life of Sabaté. Pan's Labyrinth, a 2006 film in which the insurgency of the Maquis plays a central role. Romanian anti-communist resistance movement, Romanian guerrilla of an opposite political orientation but with similar tactics. ^ "Armed resistance to Franco, 1939-1965 - Antonio Téllez". Libcom.org. Retrieved 1 April 2019. ^ Aróstegui, Julio; Marco, Jorge (2008). El último frente. La resistencia armada antifranquista en España, 1939-1952. Madrid: La Catarata. ISBN 9788483193815. ^ Raymond Carr: España 1808-1975. Ariel Historia, Barcelona, 2003. ISBN 84-344-6615-5, "El PCE organizó entonces a 4.000 voluntarios para invadir España a través de los Pirineos,", that is, "The PCE then organized about 4,000 volunteers to invade Spain by way of the Pyrenees." ^ Alfonso Domingo: El canto del búho. La vida en el monte de los guerrilleros antifranquistas. OberonMemoria, Grupo ANAYA, Madrid 2002. ISBN 84-96052-03-6. "En total, de los 13.000 españoles que estaban en el maquis francés, unos 4000 se alistaron,", that is "In total, of the 13,000 Spanish that were with the French maquis, some 4000 were listed. ^ Marin Silvestre, Dolors (2002). Clandestinos. El maquis contra el franquismo. Barcelona: Editorial Plaza & Janés. ISBN 84-01-53053-9. "…Las contrapartidas de la Guardia Civil empiezan a vaciar las zonas (…) La actuación obedece a la represión ejercida contra los enemigos políticos de su época por el aparato represor del franquismo. No se para en la detención de hombres, mujeres o niños: se les tortura o se les aplica la Ley de Fugas indiscriminadamente. Los cadáveres de las víctimas aparecen tirados en márgenes de caminos o en las puertas de los cementerios," that is, "The countermeasures of the Guardia Civil began to empty the zones (…) The means were in line with the repression exercised against the political enemies of their time by the repressive Franquista apparatus. It was not limited to the detention of men, women, or children: they tortured or applied the Ley de Fugas indiscriminately. The cadavers of the victims appeared shot on the edges of roads or the gates of cemeteries. ^ Alfonso Domingo: El canto del búho. La vida en el monte de los guerrilleros antifranquistas. OberonMemoria, Grupo ANAYA, Madrid 2002. ISBN 84-96052-03-6. ^ Alfonso Domingo: El canto del búho. La vida en el monte de los guerrilleros antifranquistas. OberonMemoria, Grupo ANAYA, Madrid 2002. ISBN 84-96052-03-6. "Frente a unos 6.000 o 7.000 guerrilleros, el número de enlaces fue diez, veinte veces mayor. Según cifras oficiales hubo 20.000 enlaces detenidos. Otros murieron a manos de las fuerzas de la Guardia Civil (…)", that is "Compared with some 6,000 or 7,000 guerrillas, the number of enlaces was ten, twenty times greater. According to official figures, there were 20,000 enlaces detained. Others died at the hands of the forces of the Guardia Civil (…)"
Beevor, Antony (2006). The Battle for Spain: The Spanish Civil War 1936-1939. London: Weidenfeld & Nicolson. ISBN 978-0-297-84832-5. Marco, Jorge (2016). Guerrilleros and Neighbours in Arms: Identities and Cultures of the Anti-fascist Resistance in Spain. Brighton: Sussex Academic Press. ISBN 978-1-84519-752-0. This page was last edited on 5 April 2019, at 22:13 (UTC).